Purchase a durable journal: Put some thought and maybe a little more money than you normally would into your average journal. Don’t buy a leather case with a monogram—but don’t buy a steno pad either. A travel journal holds a lot (or it should be able to). It needs to be durable so it can be passed around, thrown into a bag, jumbled across the desert on a camel’s back—you get the picture. If you don’t invest in your journal, then you’re not really investing in preserving your experience. Won’t it be wonderful to pass down your keepsake to your grand-children? You don’t want those pages ripping out easily and the binding falling apart sooner than it needs to. Purchase a journal that accentuates Your language: Are you a writer? Find a notebook with ample lines that allow you to keep all those thoughts and memories flowing onto the page. Or do you prefer doodles and photos? Try out a journal that has ample space for free flowing drawing or picture pasting. The key is to accentuate your communication skill. You’re writing or creating this travel book as a memory book and you’re the reader—write to You. Don’t focus on color: Maybe you’re not a colorful person—flowers and bright hues aren’t really your thing. That’s just not you. Don’t feel a travel or cultural pressure to create something pretty to others. Create something meaningful to you. Maybe a simple black pen and a plain pattern is what inspires you—maybe you like stark contrasts and pastels. If you look at your journal and it doesn’t look like you, then it won’t feel like you—then, what’s the point? Be confident in your colors and choices—they make you who you are and they make your travels uniquely you as well. Press your souvenirs: Souvenirs don’t always have to cost money—and they don’t have to be bulky, 3-D pieces of art. A simple ticket stub, or a pressed flower from a certain hike you took can help you relive your treasured memory every-time you open your book. It’s a piece that you have truly invested in, not something you bought in a shop that’s comparable to a dozen others. Choose Your Audience: Most people create a travel book, or travel journal, so that they can show friends and loved ones. That’s a wonderful idea! However, maybe you’re finding that your travel journal is really shaping up to be a personal journey or story, that you’re not really ready to share with others—for now it’s just for sure. That’s okay too. Don’t let an audience, or lack of an audience stifle your creative thought, opinions or additions to your journal. Have fun with it—it is uniquely you. Whether that part of you is broadcast to the world, or kept under lock and key for inspiration, is completely your prerogative. Include Personal Notes: Did you write a letter to someone back home that you never felt the need to send? Did you get a postcard while on your travels, or did a friend leave a note in your bag? 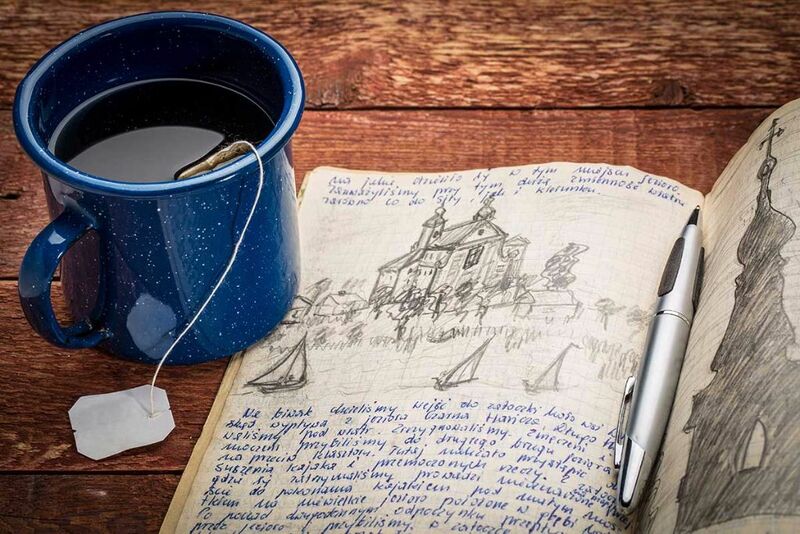 It’s tempting to throw those papers in a box under the bed, but consider accenting the emotion and moment that you felt at that time, but reliving it over and over in your travel journal. Notes, no matter how small, are a great way to really make your travel journal tell Your story and no one else’s. Hold on to those little nuggets of communication, even the seemingly meaningless ones. There will be a time when they come to mean the world to you—and what better place to store them than in your own personal travel keepsake? The goal with your travel journal should be to really show who you are and what your travels entailed, or meant to you. Travel is relative—it produces and excites different emotions and feelings in each traveler. So should your travel journal. The experience you receive when you look back, days, years or even decades later should come alive on the page. That’s only possible when you truly put the truth of You within it!